In Windows 10 you can disable frequently used folders in the quick access of MS Explorer, The solution in Windows 10 is very simple! 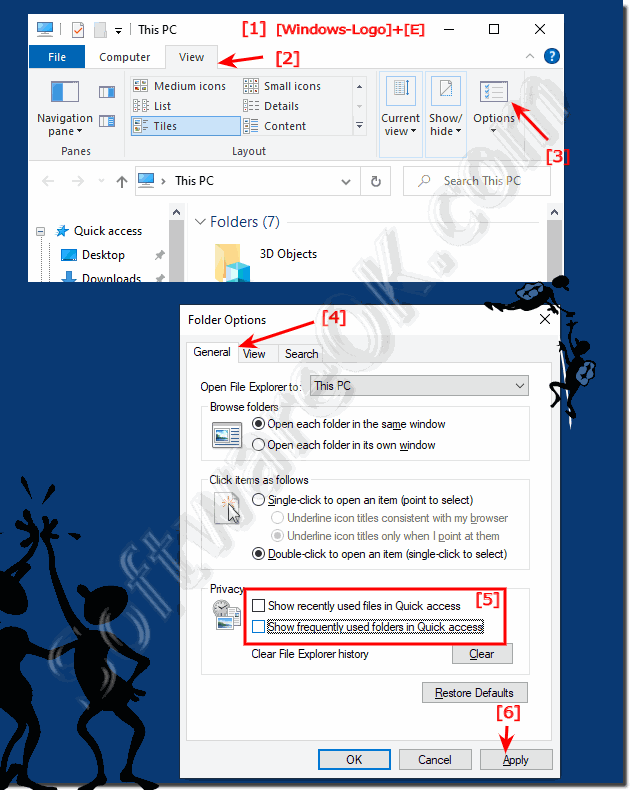 (Image-1) Show frequent folders in MS-Explorer (Windows 10 quick access)! While browsing folders in the Windows-10 Computer folder, you can apply the current view setting to all folders on your computer that are optimized for the same content as the folder you have open. For instance, the My Pictures folder is optimized for picture files. If you open this folder and change the view to Large Icons, you can apply the Large Icons view to every folder that's optimized for pictures in Windows-10. To change the type of file that a folder is optimized for, right-click the folder, click Properties, click the Customize tab, click a file type in the Optimize this folder for list, and then click OK.
Windows-10 - FAQ-34: Windows 10 remove frequent folders from explorer (quick access)?